SAP S/4 HANA has become a well-known product that is being adopted by companies, who want to take on the next steps towards the future, into the digital transformation. In this series we want to get into more depth with quite some topics and will interview product experts to get a better insight and the right information right from the source. In this interview Helmut Hofmann is joining us. He is the Product Owner for Integration within the SAP S/4HANA Cloud Foundation team and will talk to us about what you need to know about Integration with SAP S/4HANA. Bert: Hi Helmut, how are you today? Thank you for taking the time to join us today. Helmut: Very well thank you, it is always good when I can share Integration topics. Bert: Well that is why we are here today. So, tell us, what makes Integration a topic that still engages so many people. Helmut: Well, let us take a look at the trends you currently see in all areas of life, whether private or business. People, machines, technologies and businesses grow closer together and are often hyper connected. You can easily see this when we look at social media, machine learning and business networks. To make these trends work smoothly, the technology in the background has to be integrated. Only if the different systems and landscapes are integrated perfectly, the processes on top run efficiently. Bert: Actually that is nothing new. These forms of the digital economy can also be observed in several other topics that have been around for a while, like extensibility, which we talked about in the last interview. So, let us focus on the SAP S/4HANA Cloud, how does the integration concept for our enterprise cloud solution look like? Helmut: Sure, let’s take a look at the cloud. In cloud we want to ensure that our customers can run end to end business processes without disruption. In order to do this we provide best practices to our customers to run their business processes. It does not end there. We are talking about improving productivity not just for business users but also by supporting collaboration between IT and LoBs. We need to ensure that we provide capabilities to reduce complexity of infrastructure and operations with standardization and automation. We want to ensure that we increase the tool based support to enable business as well as IT to collaborate to ensure real time accurate business continuity – an example for this tool based support is the capability for both IT and business users to resolve errors on inbound message processing. A foundation for ensuring real time process execution is our pre-delivered integration content for end-to-end processes from SAP to SAP solutions. The SAP Best Practices deliver pre-defined application and integration content with defined cross system business process, which is necessary to understand the dependencies to required reference data, like for example Customizing, Code Lists, and Master Data. But not only that, several customers not only want to connect to SAP but also to other systems. We also offer the framework to support SAP to non-SAP integrations. Considering all of this, we can easily say that S/4HANA delivers integration to improve speed to value. Bert: Sounds convincing, but what exactly are the tools we are working with then integrating to different systems and landscapes when I as a customer would decide to go with the SAP S/4HANA Cloud? 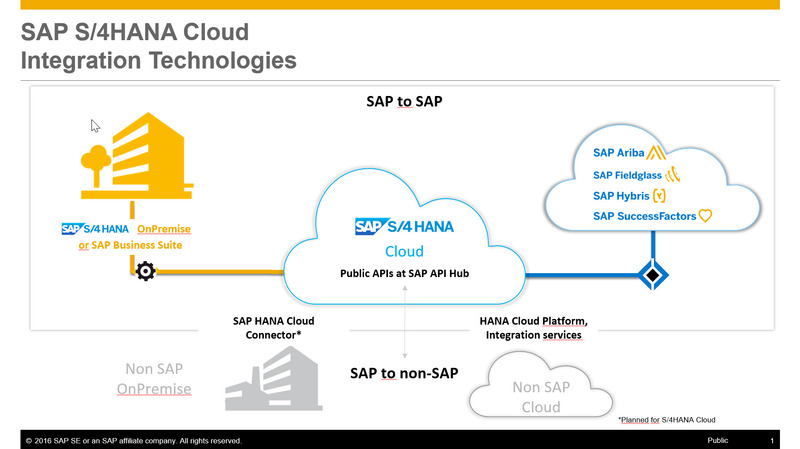 Helmut: Viewing this question from a point of a SAP S/4HANA Cloud customer, there are two technologies that enable native and mediated integrations. One is the HCI middleware, which is used to integrate to most other cloud solutions. On the one hand HCI is relevant for most of SAP cloud solutions such as SAP SuccessFactors. On the other hand the HCI middleware can also be used to integrate to non-SAP cloud solutions. The second technology, which can be used to integrate the SAP S/4HANA Cloud to SAP on-premise solutions is the SAP Cloud Connector. The essential advantage here is, that a customer can use the integration that already existed before, when moving to parts of their business suite into the cloud. Usually I, as a customer, would have to start from scratch with my integration in this scenario. With the SAP Cloud Connector, about 80% would be taken over, which makes the move that much smoother. Also the integration to other on-premise solutions, whether SAP or non-SAP, is being supported with APIs. You will be able to find a list of all APIs for SAP S/4HANA Cloud on the API Hub soon. Bert: And with which services do we work here? Helmut: The underlying mechanism is oData services, which is the preferred option, but it will also work with others. Additionally, we plan to deliver the oData services tool, using which you can also create read only APIs from the Core Data Services in S/4HANA. Bert: That was a really good overview, but can we get a little bit more accurate with this. Let’s take for example the integration to the SRM, as this is not a standard integration delivered with SAP S/4HANA, correct? Helmut: Yes that is correct. As we have the direct integration to the Ariba network, there is no immediate necessity to integrate to SRM. Bert: So how would the integration in this case look like? Helmut: Well that is fairly easy. If I, as a customer, have the need for an integration to SRM, I can drive the creation of an API for this purpose. Another option would be to use the SAP Cloud Connector to integrate to the SRM system. No matter which way the customer would take, the integration, even if it isn’t part of the standard delivery, is made easy and uncomplicated. Bert: Great, that is what cloud is all about. Maybe one last question at the end. Security is another topic that is what the cloud is all about. Can you tell me more about data security, when working with two or even more cloud solutions? Helmut: Security is of course the highest priority for SAP. A lot of customers have doubts when opening up their protected on-premise systems for integration to cloud systems. The SAP Cloud Connector offers maximum security, in order to guarantee that only the desired integration scenarios communicate with the cloud. A lot of the communication scenarios are defined to make the on-premise system in control of the communication. That way attackers acting from the internet have no chance. Overall it is highly controlled who can exchange data with whom, through the communication arrangements, and every further communication is being prevented. Bert: Well, I believe that gives great confidence and is a good end for this interview. Thanks again Helmut, I think we were definitely able to answer quite some questions here. Helmut: I can only agree with that. This is only one of many topics we will cover in this series. With this we want to give you an insight into the topics you were always interested in knowing more about. Thanks again to the experts for sharing their knowledge with us. And stay tuned for even more interesting topics, next up is Fiori 2.0. 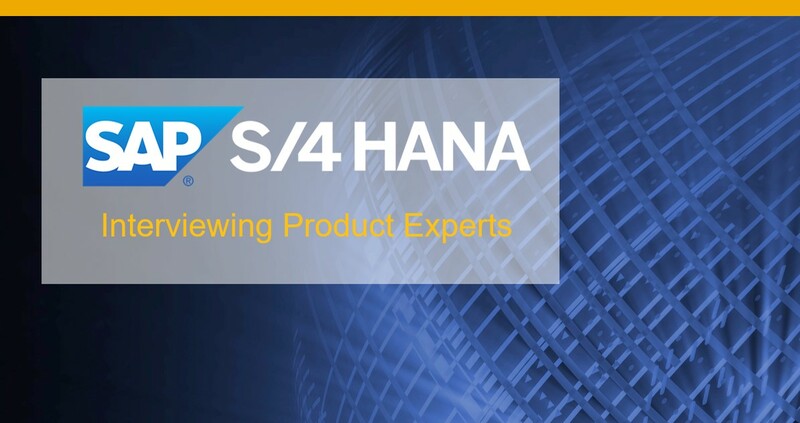 If you enjoyed this blog, find the information useful or want to read more blogs like these, let us know by hitting the “Like” button and if there is any topic with SAP S/4HANA you would like to hear more about, tell us in the comments below.